During my first pregnancy, I quickly learned that choosing the best prenatal vitamins went hand in hand with having excellent nutrition. However, deciding what to take was confusing, thanks to the overwhelming amount of conflicting information about prenatal vitamins in news stories and flashy advertisements. But here’s what I learned: Although your prenatal vitamins should have certain things in them to help ensure your and your baby’s good health (like folic acid and iron), there are additional factors to consider when choosing your prenatal vitamins, including whether prenatal vitamins tend to make you queasy and whether you take medication. 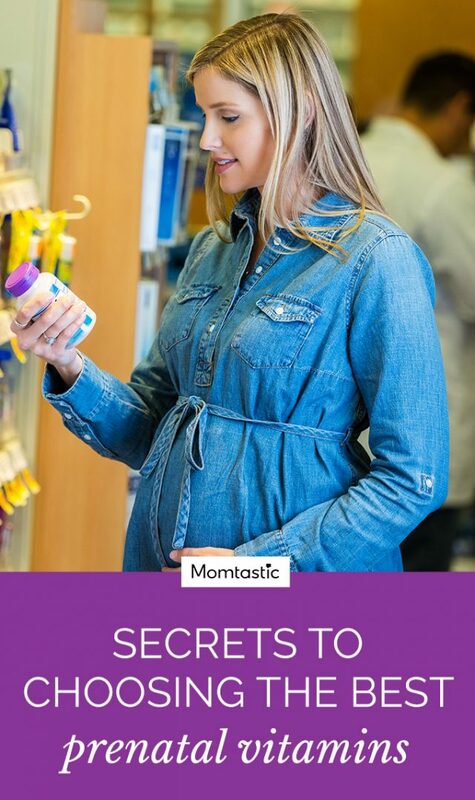 Check out the guide below, for everything you need to know about choosing the best prenatal vitamins. Switch up your women’s daily vitamin for basic prenatal vitamins now before you try to get pregnant, because here’s the thing: By the time you discover you’re expecting, you’ll probably be about 4- to 6-weeks-along, which is a very important developmental period for the fetus. Giving him everything he needs from day one is as easy as changing out the vitamin you take in the morning, says Amy Picklesimer, MD, a maternal fetal medicine specialist, in Greenville, South Carolina. Are over-the-counter prenatal vitamins just as good as prescription ones? “The most clearly important ingredients in prenatal vitamins are folic acid and iron to prevent birth defects and anemia problems,” says Mollie Grow, MD, a pediatrician with Seattle Children’s Hospital. “The over-the-counter prenatal vitamins provide adequate amounts of these nutrients.” Dr. Grow says that she took over-the-counter prenatal vitamins during her pregnancies, along with eating a healthy diet, getting plenty or rest, and exercising regularly. Why is it important to take a prenatal vitamin? Prenatal vitamins provide important nutrients for your baby, but they also help ensure your good health during your pregnancy and after, too. Babies will take what they need from their mothers — even if that means literally pulling the calcium from their moms’ bones (which can lead to osteoporosis later in life), says Dr. Picklesimer. So, in addition to eating a nutritious diet, it’s important to take a vitamin that will help ensure that you don’t develop any nutritional deficiencies as your baby grows. What should be in your prenatal vitamins? Folic Acid: 400 micrograms. Folic acid can lessen the chance of brain and spinal birth defects by 70 percent. Calcium: 1,000 milligrams. Babies need calcium for developing bones, nerves, teeth, and more. Iron: 27 milligrams. Iron prevents maternal anemia and is important in fetal brain development. Vitamin D: 600 IU. Vitamin D helps your baby absorb the calcium and put it to good use. DHA: 200 milligrams. DHA is an omega-3 fatty acid that is needed for your baby’s developing eyes and brain. Iodine: 220 micrograms. Not only does this help build a healthy central nervous system, the thyroid needs it to make hormones. What’s the best time of day to take prenatal vitamins? Some women feel nauseated by their prenatal vitamins, so Dr. Pickelsimer recommends taking it before bed, with a snack or small meal. Hopefully, you’ll sleep through any queasiness. Should you take your prenatal vitamins with water? Yes — and, really, you should be drinking at least eight 8-ounce glasses of water throughout your pregnancy anyway. If you need a change, orange juice can help you absorb the iron in your vitamin better, says Dr. Pickelsimer. But don’t take it with milk, calcium, or antacids, which can all prevent the iron from absorbing properly, she warns. Is it necessary to take additional supplements? When your doctor draws your blood at your first prenatal appointment, one of the things that she’s testing for is nutritional deficiencies. If you’re in good nutritional health, you don’t need to take additional supplements, says Dr. Pickelsimer. Your main goal is to have good levels of what you actually need, not large doses of extra stuff you don’t. For example, iron is important during pregnancy, but too much isn’t healthy (and it can be constipating in any dose). Find the right amount for you—and maybe look for a prenatal that also has a stool softener in it to ease things along. Also, too much Vitamin A or beta carotene will increase the risk of birth defects, says Serena H. Chen, MD, Director Reproductive Medicine, IRMS at Saint Barnabas, NJ. What should you do if your prenatal vitamins make you feel nauseated? Dr. Picklesimer encourages patients to take the time to find the right vitamin for them. “There are a ton of different brands out there and different combinations of things in the vitamins,” she says. 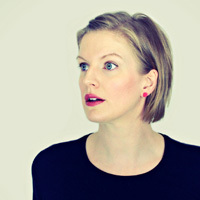 “If the first one doesn’t seem to be sitting well in your stomach, you should try something different.” And if you can’t find a prenatal that sits well? Ask your doctor if you can try an over-the-counter women’s daily multi-vitamin, which usually has most of what you need, anyway, and adjust your diet to fill any nutritional gaps. If swallowing adult prenatals or multi-vitamins doesn’t fly with your sensitive stomach, Dr. Picklesimer recommends trying a children’s chewable multi-vitamin. It has most of what you need (except iron), and is definitely better than taking nothing at all. Are there special prenatal vitamins for women who experience Hyperemesis Gravidarum or extreme morning sickness? Yes, and they can help ensure that you’re getting a decent nutritional baseline, even if you’re vomiting frequently, says Dr. Pickelsimer. Your ob-gyn or midwife can recommend that one that’s right for you. 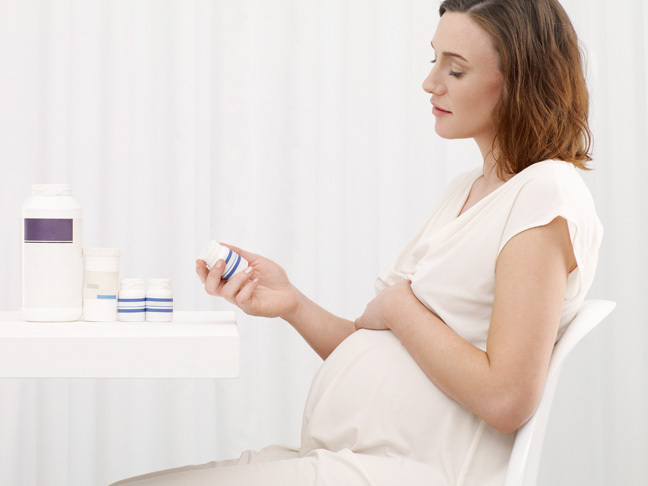 Can other medications interfere with prenatal vitamins? Yes. If you take medication for a seizure disorder, for example, you’ll need more than the typically prescribed 400 micrograms of folic acid a day. To be safe, be honest with your doctor about everything you put in your body, including herbal remedies in pill, tea, or other forms; supplements; over-the-counter medications; and prescription medications. Choosing the right prenatal vitamin might seem overwhelming, but your doctor is there to help you make the right choice, says Dr. Picklesimer. So take heart: By working with your doctor you will find the right vitamin!